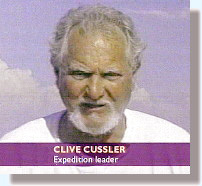 On 9th August 2001 strong media attention was given to the story that the wreck of the 'Mary Celeste' had been located by Clive Cussler, representing the National Underwater & Marine Agency, (NUMA) and John Davis, president of ECO-NOVA Productions of Canada. The location of the wreck was well documented, and the scientific value of the find perhaps questionable. Given the detail of the investigation in Gibraltar and the fact that she was in service for a number of years subsquently it is unlikely to yield any new information regarding the original mystery.